On 15th May 2014 Peter Anderson had lost his driving licence and consequentially his job. He was homeless and couldn’t find work and was suffering from depression. He decided to take his own life and attempted to throw himself under a train at Leigh on Sea train station in Essex. Police there stopped him and did what anyone would do when faced with a suicidal man at the end of his tether – they prosecuted him. On 4th June Mr Anderson pleaded guilty and was conditionally discharged for three months. The news report says ‘trespass’ but that is not, of itself a criminal offence (it’s a civil wrong for which you can be sued, but not prosecuted). This was designed to stop raves, but has been applied to other areas since. Does it cover this? There is an issue as to whether he was ‘trespassing’. If he didn’t have a ticket then he would be, if he threw himself on the tracks he also would be (as members of the public are not allowed there), but if he was on the platform preparing to jump, but was then stopped, then it might not be. The ‘activity’ referred to would be people travelling on the train. Whilst they would be obstructed and disrupted had Mr Anderson killed himself, it is unlikely that he would have been intending that effect (even if he was, or would have been had he thought about it, aware that that would have been the impact). For this reason it is not immediately clear that he would be guilty of this. There is also an offence of Endangering Life on a Railway contrary to s34 Offences Against the Person Act 1861. This states that “Whosoever, by any unlawful act, or by any wilful omission or neglect, shall endanger or cause to be endangered the safety of any person conveyed or being in or upon a railway, or shall aid or assist therein, shall be guilty of a misdemeanor, and being convicted thereof shall be liable, at the discretion of the court, to be imprisoned for any term not exceeding two years,”. The trespass may count here as an unlawful act. Although this is not obviously designed for this sort of a situation, it is arguable that if he endangers his own life then this could count as the person who’s safety was endangered. There are several summary only offences (s16 Railway Regulation Act 1840, s23 Regulation of the Railways Act 1868 and s55 British Transport Commission Act 1949) but these all require a warning to be given before an offence is committed. So, on balance we’d guess that the correct offence was the Endangering Life on a Railway. Even then, it is not clear that the offence was made out. What do you make of the sentence? There is no minimum period for which a conditional discharge can run, but 3 months is about as short as it gets. Short of an absolute discharge (which may have been a more appropriate sentence, but is very rare), it’s the least he could have got. There is no mention of the victim surcharge, but Mr Anderson would have had to pay £15 for this (a further demonstration of what nonsense this is). On the face of it, this seems a ludicrous prosecution. There is a Code for Prosecutors that sets out when a prosecution should be instigated and continued. There is an ‘evidential’ part (which would be met’ and a ‘public interest test’ – a prosecution should not be commenced unless it is in the public interest. The CPS said “the prosecution was in the public interest. In this case, due to the fact the defendant was on prohibited land, namely train tracks, and by his doing so could harm or cause distress to other members of the public and/or their safety it is clear that it was in the public interest to proceed. I have to say that this appears to me to be nonsense. It’s always possible that there are more facts than in the newspaper (and it is the Daily Mail after all) but there is nothing on the CPS website to indicate that they disagree with the facts. This entry was posted in In the news and tagged Daily Mail, prosecution, PS, Public Interest, Railway on 05/06/2014 by Dan Bunting. We looked at the case of Robert Riley who was jailed last month for tweeting offensive messaged relating to the death of Ann Maguire. Well, Mr Riley has a companion – on 4th June 2014 Jake Newsome was sentenced to six weeks in prison for a ‘malicious communications charge’. He was using Facebook rather than twitter, but the same issues are apparent. As in most tweeting/social media cases the full messages aren’t published. According to the BBC – “Jake Newsome wrote that he was “glad” she had been stabbed and he “felt sorry” for the boy accused of her murder. The 21-year-old completed his post with an obscene suggestion“. It’s not clear what the charge is. The news reports would indicate that it was under s1 Malicious Communications Act 1988, but it would be a similar outcome if it had been under s127 Communications Act 2003. Firstly the sentence. The Magistrates’ Court Sentencing Guidelines are applicable (see page 40). Looking at the guidelines does not help much as they relate to telephone calls. But it would appear to have been treated by the Court as being a series of offensive messages with extreme language and a moderate impact. The increase in sentence from the starting point of six week (before the credit for a plea of guilty) may be explicable by the Court treating these messages as causing ‘substantial distress or fear’. Communications which may constitute credible threats of violence to the person or damage to property. Communications which specifically target an individual or individuals and which may constitute harassment or stalking within the meaning of the Protection from Harassment Act 1997. Communications which may amount to a breach of a court order. Communications which do not fall into any of the categories above and fall to be considered separately (see below): i.e. those which may be considered grossly offensive, indecent, obscene or false. It seems that there was not any argument as to the policy in Court (and in any event there have been some fairly dodgy decisions of the Court of Appeal on this point) which is disappointing. Is this a case that calls out for a prosecution? Is one needed in the public interest? Is it compatible with Art 10 European Convention on Human Rights? We would suggest that the answer is no to all the above. Yet again we are seeing a knee jerk reaction by the CPS to people being caused offence (which is not, and should not be, a criminal offence). It is time that the CPS were called to justify how some of the decisions to prosecute are being made in these sorts of offences. This entry was posted in In the news and tagged Jake Newsome, prosecution, Twitter on 04/06/2014 by Dan Bunting. 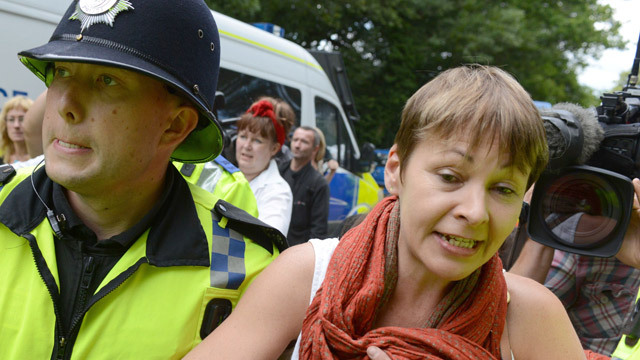 On 25th September 2013 the CPS announced that Caroline Lucas, the MP for Brighton Pavillion, and the only Green Party MP in the UK, will be prosecuted following her attendance at an anti-fracking protest last month. then they can give directions as to the location, duration, or maximum number of attendees at a protest. There are three separate offences that this section creates, depending on the individuals role in the protest. A protester that fails to comply with the direction can be fined (maximum Level 3 fine). Someone who is organising the protest, or someone who incites others to breach a direction, can be sent to prison for a maximum of 3 months or a Level 4 fine. There are no sentencing guidelines. This is an offence under s137 Highways Act 1980. Someone is guilty of an offence if “without lawful authority or excuse, [they] in any way wilfully obstructs the free passage along a highway“. The maximum sentence is a Level 3 fine. As well as ‘factual defences (as in “it wasn’t me”), there are potentially arguments over the reasonableness and lawfulness of the behaviour of the police and the protesters, as well as arguments relating to the ECHR and the right to peaceful protest. We will look at those in detail when the case has finished. She is due for a first appearance at Crawley Magistrates’ Court on 9th October. Although these offences will conclude in the Magistrates’ Court and there won’t be a jury trial, we will refrain from saying anything more about it until the case has concluded. This entry was posted in In the news and tagged Caroline Lucas, cps, prosecution, protesting on 25/09/2013 by Dan Bunting.